Both Drs. Macones and Lyndon-Rochelle are medical professionals and researchers who made these statements at the 2010 NIH [National Institutes of Health] VBAC Conference. Now you may think, “Wait a sec. Everything I’ve heard from my family, friends, and medical provider is how risky VBAC is and how cesareans are the conservative, prudent, and safest choice.” Why the discrepancy between the statements of these two prominent care provider researchers and the conventional wisdom prevalent in America? It’s likely that your family, friends, and even your medical provider are not familiar with the latest and best compilation of VBAC research that was released in March 2010. 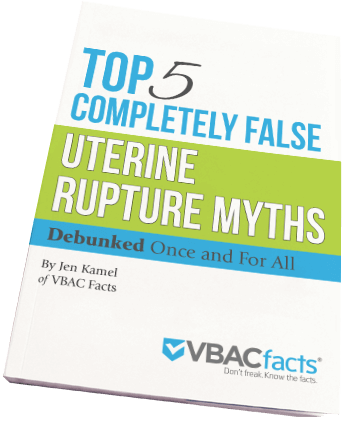 It’s also possible that they are not familiar with the latest VBAC recommendations published in July 2010 by the American Congress of Obstetricians and Gynecologists (ACOG). Additionally, there are often legal and non-medical factors at play that influence how care providers counsel women on VBAC, including pressure from hospital administrators. Quality assessment is an assessment of a study’s internal validity (the study’s ability to measure what it intends to measure). If a study is not conducted properly, the results that they produce are unlikely to represent the truth and thus are worthless (the old adage garbage in garbage out). If however, a study is structurally and analytically sound, then the results are valuable. A systematic review, is intended to evaluate the entire literature and distill those studies which are of the highest possible quality and therefore likely to be sound and defensible to affect practice. Guise focused on these key questions: “1) a chain of evidence about factors that may influence VBAC, 2) maternal and infant benefits and harms of attempting a VBAC versus an elective repeat cesarean delivery (ERCD), and 3) factors that may influence maternal and infant outcomes.” Ultimately, this 400 page document was distilled into the 48 page VBAC Final Statement produced by the NIH VBAC Conference. This is wonderful because people who want the big picture, can read the VBAC Final Statement whereas those who want to know the exact figures, how studies were included/excluded, and the strength of the data available, can read the Guise 2010 Evidence Report. You can get a feel for the topics presented at the NIH VBAC Conference by reading the Programs & Abstracts document. If you want more detail, you can watch the individual presentations. I was there for the three day conference and it was eye opening. I wish more medical professionals and moms were aware of this information as they are excellent resources for anyone looking to learn more about VBAC. Everyone wants to know the bottom line: what is the risk of death or major injury to mom and baby. Here is an overview of maternal and infant mortality and morbidity per Guise (2010). It’s important to remember that the quality of data relating to perinatal mortality was low to moderate due to the high range of rates reported by the strongest studies conducted thus far. Guise reports the high end of the range when they discuss perinatal mortality which was 6% for all gestational ages and 2.8% when limited to term studies. This is a long way of saying, we still don’t have a good picture of how many babies die due to uterine rupture. It’s also important to remember that the statistics shared in Guise (2010) are for all VBACs. They include all scar types, women who have had multiple prior cesareans, induced/augmented labors, etc. It would have been helpful if they had broke out the data in these ways as we know we can reduce the risk of rupture (and thus perinatal mortality) through spontaneous labor. While rare for both TOL [trial of labor after cesarean] and ERCD [elective repeat cesarean delivery], maternal mortality was significantly increased for ERCD at 13.4 per 100,000 versus 3.8 per 100,000 for TOL. The rates of maternal hysterectomy, hemorrhage, and transfusions did not differ significantly between TOL and ERCD. The rate of uterine rupture for all women with prior cesarean is 3 per 1,000 and the risk was significantly increased with TOL (4.7 1,000 versus 0.3 1,000 ERCD). Six percent of uterine ruptures were associated with perinatal death. Perinatal mortality was significantly increased for TOL at 1.3 per 1,000 versus 0.5 per 1,000 for ERCD… VBAC is a reasonable and safe choice for the majority of women with prior cesarean. Moreover, there is emerging evidence of serious harms relating to multiple cesareans… The occurrence of maternal and infant mortality for women with prior cesarean is not significantly elevated when compared with national rates overall of mortality in childbirth. The majority of women who have TOL will have a VBAC, and they and their infants will be healthy. However, there is a minority of women who will suffer serious adverse consequences of both TOL and ERCD. While TOL rates have decreased over the last decade, VBAC rates and adverse outcomes have not changed suggesting that the reduction is not reflecting improved patient selection. Women are entitled to accurate, honest, and high quality data. They don’t deserve to have the risks exaggerated by an OB who wishes to coerce them into a repeat cesarean nor do they deserve to have risks sugar-coated or minimized by a midwife or birth advocate who may not understand the risk or whose zealous desire for everyone to VBAC clouds their judgement. Sometimes it can be hard to find good data on VBAC which is why I’m so thankful for the 2010 NIH VBAC Conference and all the excellent data that became available to the public as a result. There are real risks and benefits to VBAC and repeat cesarean and once women have access to good data, they can individually choose which set of risks and benefits they want. I think the links I have provided above represent the best data we have to date. While it’s true that Dr. Lydon-Rochelle has earned the title, she is not an obstetrician. She’s a certified nurse-midwife and a PhD, well-known for her research. Please don’t contribute to the fallacy that only MDs have authority by failing to recognize the excellent education and work of a doctorally-prepared CNM.